Reblogging this from David Meyer’s wordpress site. As I hope you have heard, Ringling Bros. have announced that they will be phasing out the use of elephants in their shows. This is a huge development! Historic! Our responsibility to honor our fellow non-human animals in this time of species collapse demands that out-dated exploitations like this end. Thank you, Ringling Bros.! As anyone who has stumbled across the internet and sampled a tiny sliver of the astounding variety of cat videos, animals can be entertaining. For years animal rights advocates have been emphasizing the price those animals pay for our amusement. When we learn that elephants are beaten in training, we may become a little less impressed by those amusing tricks. Maybe, we go to the movies or a concert instead of dragging the family to the circus. After years of countering the rhetoric, and offering reforms in training methods, even litigating against its critics (and winning! 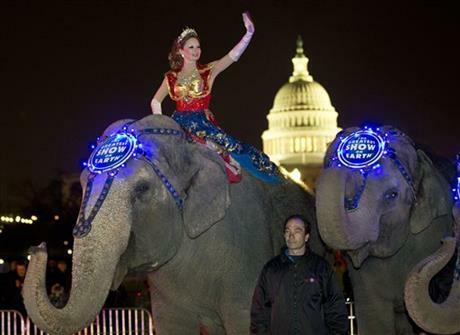 ), Ringling Brothers has given up, announcing that it will phase out the use of elephants in its circus shows. There are a lot of factors–as there always are: circus audiences are declining; taking care of elephants is expensive; and some cities have laws banning elephant performances.